A detailed history about the onset of symptoms and signs must be obtained, followed by a clinical examination to determine the level of consciousness (GCS score), to assess for signs of elevation in the ICP, and to screen for neurologic deficits. Standard blood tests are used by the author to prepare patients for surgery, such as complete blood count, electrolytes, coagulation times and cross-match, in case transfusion is required. There is a limited need for CT scans. Emergency: Sometimes CT is the imaging modality for the initial diagnosis. Calcification: CT demonstrates calcifications better than MRI. Axial CT scan, enhanced: The scan shows a right frontal tumor, with brain edema and areas of calcification. MRI is the imaging of choice and the ideal scan. Standard protocol: Axial, sagittal, and coronal T1-weighted sequences; axial T2-weighted sequence; axial diffusion, fluid-attenuated inversion recovery (FLAIR), and post-contrast sequences. Precontrast MRI: The tumor will appear hypointense on T1, hyperintense on T2, and intermediate to high intensity on FLAIR signal relative to both white and gray matter. Typically the tumors have heterogeneous signals, and cystic areas are frequently seen. Calcifications and old hemorrhage are common. Postcontrast MRI characteristics: Gadolinium enhancement shows great uptake in the soft tissue components of the tumor, but some areas may have poor enhancement. 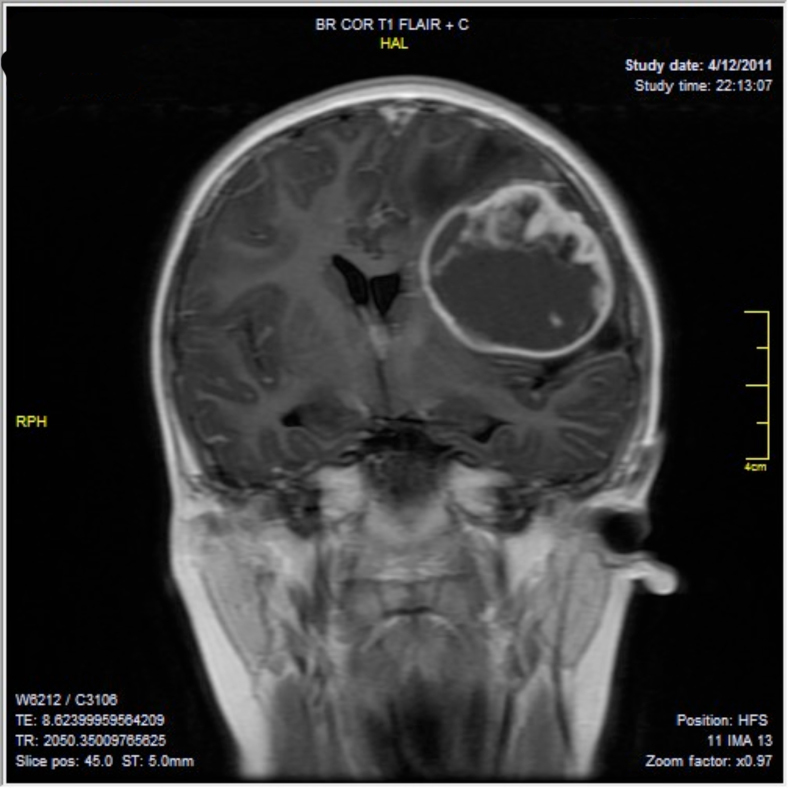 Coronal and axial T1-weighted contrast images of a recurrent ependymoma: Multiple cysts have developed within the tumor, resulting in a more difficult surgical resection. MRI of the spine: MRI of the spine should be obtained to assess for leptomeningeal dissemination. Limited need: Perfusion MRI is not often used. It may be useful in demonstrating increased blood volume. Limited need initially: The appearance of these tumors is similar to others, showing an elevated choline level and reduced N-acetylaspartate (NAA). Useful later in therapy: Proton MR spectroscopy is useful to try to distinguish tumor recurrence from postoperative changes or postradiation changes. Evolution of symptoms and appearance on imaging: On the basis of clinical symptoms and radiologic images, the usual differential diagnosis of this type of intracranial tumor, which is solid-cystic in nature, includes pilocytic astrocytoma, pleomorphic xanthoastrocytoma, or ependymoma. 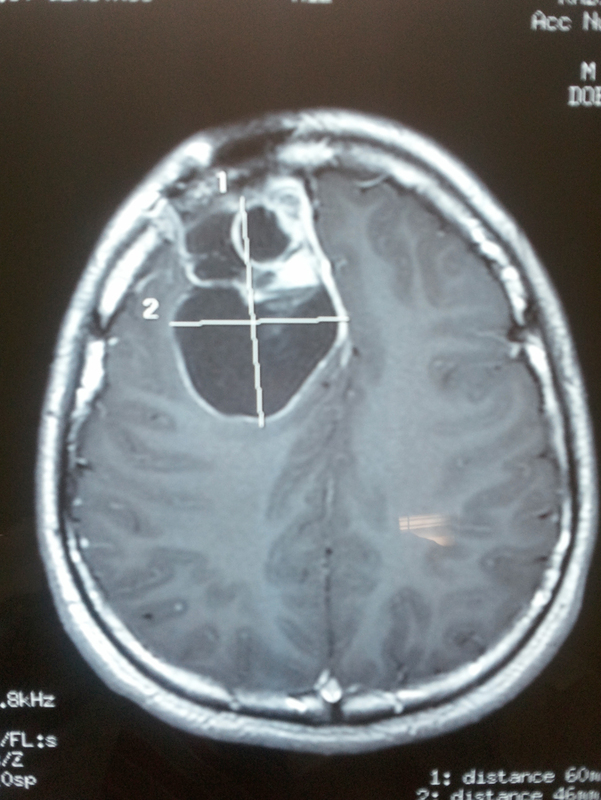 Slowly evolving symptoms and a tumor within the fourth ventricle extending out its foramen favors ependymoma.